As 2018 draws to a close, I reflect with pride on a year where our discoveries continue to transform lives and shape the future both in the UK and across the world. Next year I look forward to further building our knowledge exchange, positioning the University in readiness for REF 2021, and enhancing our international reputation for innovation and collaboration through the delivery of world-leading research. Your support and hard work makes possible all our successes and will help us achieve the milestones we have set ourselves. I’d like to personally thank you for the all work that you do and I look forward to 2019 as, together, we build upon our achievements this year to deliver on our research goals. Please read on for a snapshot of some of our great work and achievements this year. With very best wishes for the festive season and a happy new year. We continue to build and extend a world-class physical and digital environment to support research. 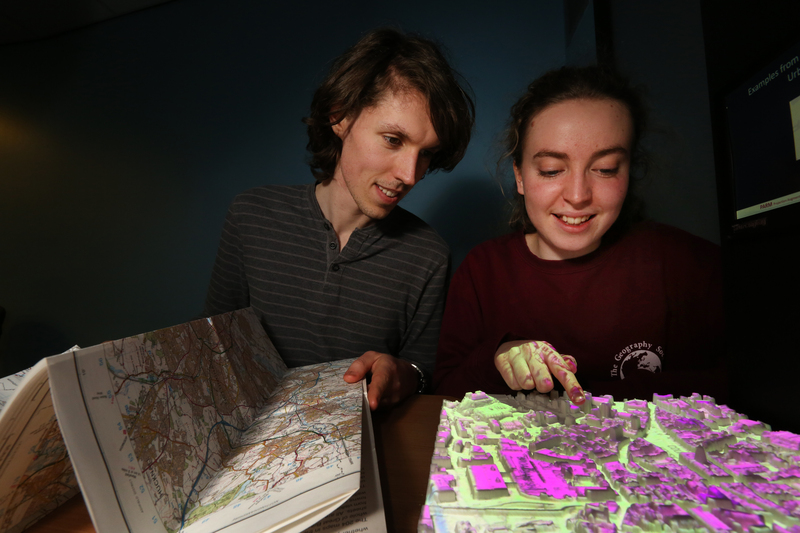 This year we launched Augusta, a High Performance Computing Service, whilst our Digital Research Week, held in April, allowed researchers to explore new tools and capabilities. Look out for 2019’s Digital Research year of Engagement, including digital research roadshows, research data management drop-in clinics and data science seminars. We have invested in our physical research environment. Facilities such as the new Advanced Manufacturing Building, recently opened by Jurgen Maier, CEO of Siemens, are already hubs of world-class innovation and collaboration with industry, and the Research Acceleration and Demonstration (RAD) building, part of our work with the Innovate UK-funded Energy Research Accelerator (ERA), provides space and facilities for pioneering energy research projects. I  am delighted our very successful fellowship recruitment has seen a doubling in applications to our prestigious and highly competitive Nottingham and Anne McLaren Research Fellowships. This year we offered fellowships to researchers from other top institutions such as  the Massachusetts Institute of Technology, Harvard, Manchester, Oxford and Cambridge. 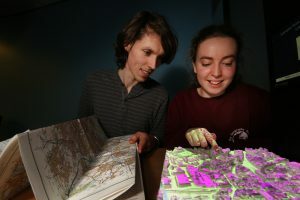 It is also significant that many of these exceptional candidates say they are drawn to Nottingham by our facilities, the opportunity to work alongside renowned academics, and our strengths in interdisciplinary research, as embodied in our Research Priority Areas and Beacons of Excellence. So far 36, of these outstanding individuals have joined the 18/19 cohort. 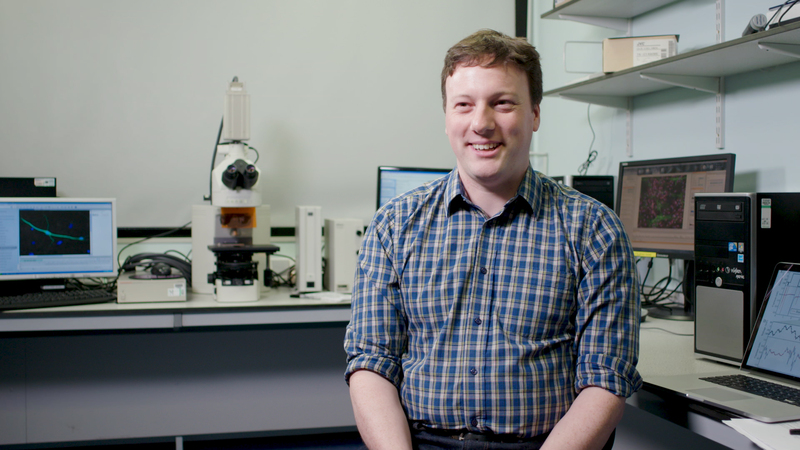 And recently, one of our Nottingham Research Fellows, Dr Gary Mirams, won a Wellcome Trust Senior Research Fellowship and funding of more than £1.9 million to develop mathematical models to test whether new pharmaceutical drugs will have side-effects on the heart. In the current recruitment round of 586 application,  72  candidates have been shortlisted by schools and Faculties, and I look forward to sharing further details with you as we progress through this latest process. The Beacons of Excellence have made significant progress over the last year: making strong academic appointments, installing key equipment, winning external grants and developing new partnerships. Members of the Rights Lab were at the UN headquarters in New York for the launch of the 2018 Global Slavery Index, whereas the Future Food Beacon and Rothamsted Research has launched a scheme to support 20 fellows as visiting researchers in the UK. The Propulsion Futures Beacon’s electric superbike enjoyed success at the Isle of Man TT Zero race, and the beacon has also started developing the world’s first all-electric race airplane. In 2019, we will continue to see major advances towards solving the research challenges the Beacons have set out, as well as an increasing the number of high-profile outputs, including publications. We will also see the momentum the Beacons have built in our academic community further accelerate as they continue to engage and collaborate with you all. The reputation and work of our researchers in delivering research that has impact in the real world will further be enhanced and supported by 2018’s unveiling of the University’s Institute for Policy and Engagement, which is led by Stephen Meek, whose mission is to ensure your research has the impact and recognition it deserves, and that we play our part in helping solve the most important problems facing the world today. The Institute will be officially launched in 2019. Professor Barrie Hayes-Gill and Vice-Chancellor Professor Shearer West. We’ve also built on our capacity to commercialise our discoveries, for example our spin-outs secured £35m in external investment in what was a record year. We have created the largest university patent offering in the UK by engaging with eight other universities in the region under the Midlands Innovation Commercialisation of Research Accelerator (MICRA) and extend collaborations with industry. 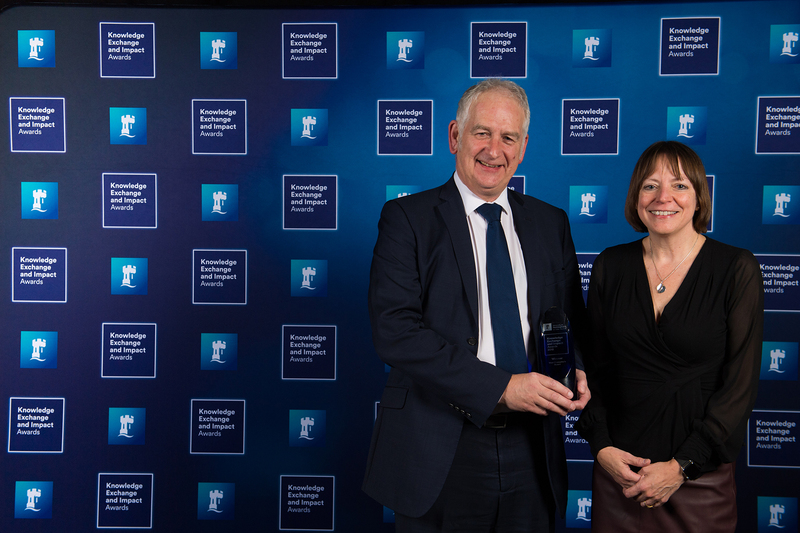 Among the many outstanding examples celebrated at the University’s Knowledge Exchange and Impact Awards was that of Professor Barrie Hayes-Gill. The sale of his pioneering wireless foetal heart monitor to GE Healthcare generated significant funds for the University and ensures this technology will be used by women in labour around the world. Other research projects recognised at the these awards included: a community energy project at Nottingham’s Trent Basin, where University scientists are working in collaboration on a UK model for self-sufficiency in green power; our world-leading research in antislavery; jet engines maintenance; and bacteria-resistant plastics for urinary cathetars that will reduce hospital-acquired infections. Many of these outstanding projects are profiled in the second edition of Vision, the University’s research and knowledge exchange magazine, and in our recent research campaign Discovery for the world, which further celebrated the impact of our innovations. 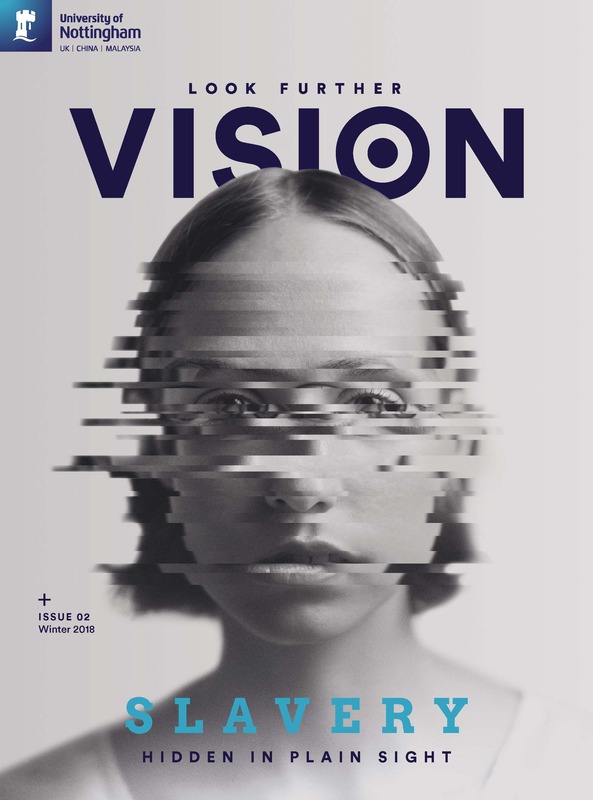 Vision magazine was first launched in June, with highlights including a £4.4m award from the Bill & Melinda Gates Foundation to tackle hidden hunger in Malawi and Ethiopia. The international impact of this GeoNutrition project has been recognised by Professor Martin Broadley’s Biotechnology and Biological Sciences Research Council’s Innovator of the Year award. 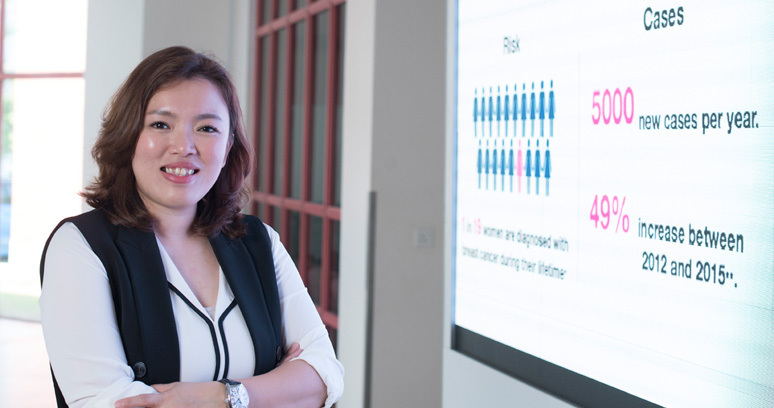 Weang Kee Ho is developing an early warning tool for breast cancer. Internationally, the Discover our world reputation campaign in Malaysia and its counterpart in China delivered a highly public profile for the excellent research and teaching at both our China and Malaysia campuses. In China, highlights included the opening of the new University of Nottingham Electrification Centre based in YuYao, Ningbo. 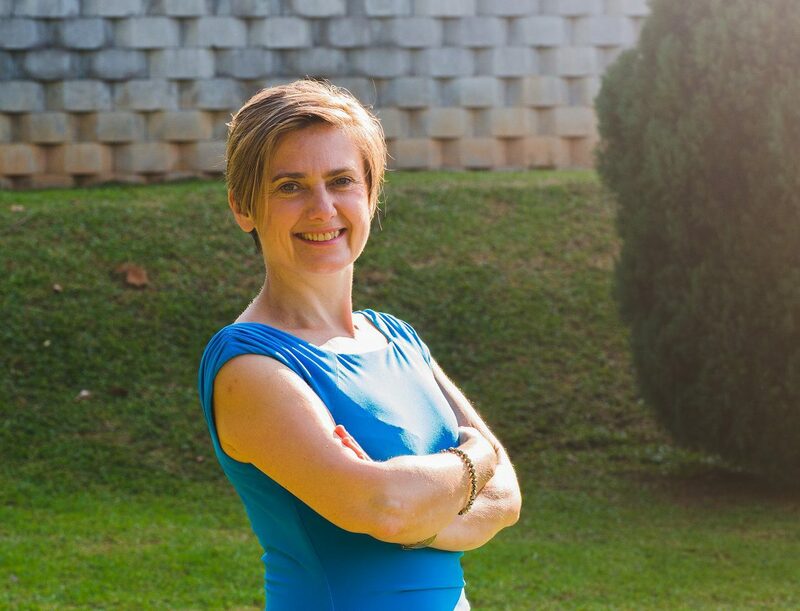 In Malaysia, we showcased research which included the conservation of elephants through better understanding of ecology and natural habitats, and a new early warning tool that could help to predict which women in South East Asia are most at risk of developing breast cancer. 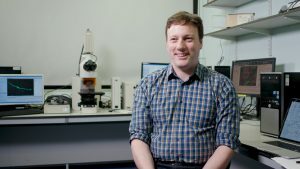 The School of Computer Science’s Professor Tom Rodden appointed as the Chief Scientific Adviser for the Department for Digital, Culture, Media and Sport. 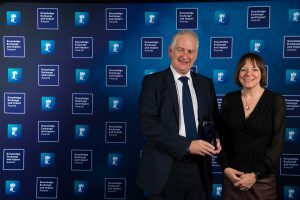 The Royal Academy of Engineering also elected Professor Rodden as a Fellow of the academy, while Professor Sam Kingman and Dr Chris Dodds of the Faculty of Engineering win a prestigious award for a revolutionary process for extracting copper. Professor Ian Hall, Director of the NIHR Nottingham Biomedical Research Centre, was elected to as a Fellow of the Academy of Medical Sciences. Professor Terry Moore, Director of the Nottingham Geospatial Institute, became the new President of the Royal Institute of Navigation. Dr Andrew Mumford of the School of Politics and International Relations has been elected as a Fellow of the Royal Historical Society. Professor Andrew Noyes from the School of Education become the 18th Chair of the Joint Mathematical Council of the UK. 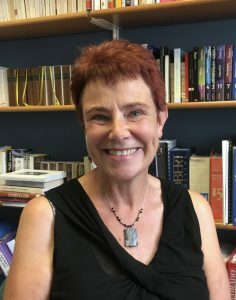 Judith Still, Professor of French and Critical Theory, was elected as a Fellow to the British Academy. Professor Thomas O’Loughlin from the Department of Theology and Religious Studies was appointed an Honorary Member of the Royal Irish Academy. It is also significant that a number of academics and research leaders from the University have been appointed to Research Excellence Framework (REF) 2021 panels for both criteria setting and assessment. Professor Neil Crout takes up a new role as the Academic Lead for Impact.